Chrom šrouby kol M12 x 20 mm (prodloužená verze) set 5ks. Wheel bolts chrome M12 X 1.5 key 22 thread 20 ball 5pcs. 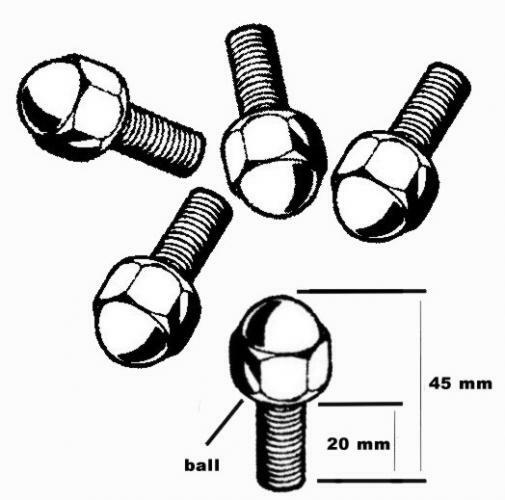 Bright chrome finish and acorn design are these wheel bolt’s trademarks. Designed for those who prefer bolt style over stud type. One piece design is of the highest quality. Mangels triangular - kolo ocelové/chrom 5.0 x 15 - PCD 5 x 205 mm 1ks. Mangels triangular - kolo ocelové/chrom 8.0 x 15 - PCD 5 x 205 mm 1ks.